Our story begins with the Husky Clipper, in which UW famously won the 1936 Olympic gold medal. This is the tale of an unlikely and heroic feat 50 years ago by a lesser-known program whose members showed similar fearlessness and perseverance. Collegiate rowing has a history of making big headlines in Seattle, but this story is not about racing; there were no medals. 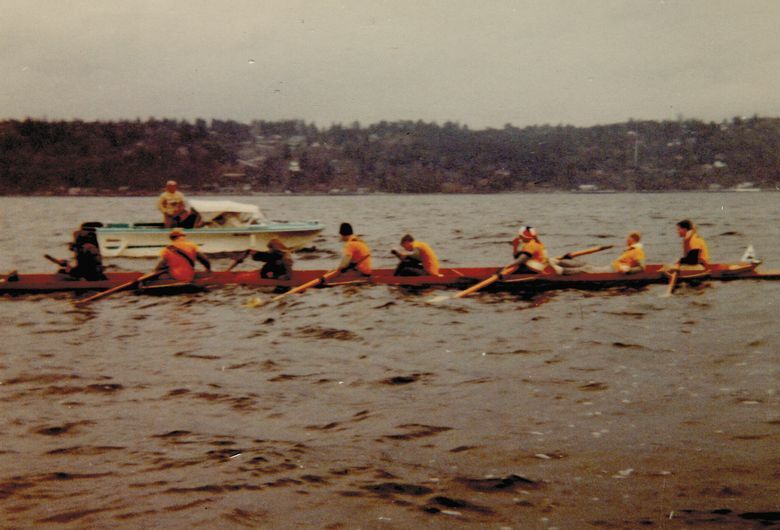 The only thing the Pacific Lutheran University oarsmen had when they got back to their dorm rooms that December 1967 night were fatigued bodies numbed by the cold, soaked by waves and blistered from seemingly endless hours of pulling on oars. The newspaper story described the event as “a conquest of epic proportions” and recited the oarsmen’s dedication and perseverance, telling in detail how they rowed an eight-oared shell from Seattle’s Lake Union to Tacoma. They started before dawn, rowing through the Ballard Locks, combating wave-crested Elliott Bay and — as twilight was coming on — making it to Tacoma’s Point Defiance, a distance of more than 40 miles. But why? Some sort of stunt? Fraternity prank? A punishment exacted by a sadistic coach? None of the above. It was a matter of absolute necessity. The PLU crew had to get the shell to American Lake, where they trained and raced. Unable to come up with the funds to move the boat on the road, they went by water. They would row the boat to Tacoma. And they did. An article that ran in the Dec. 17, 1967 Seattle Times. 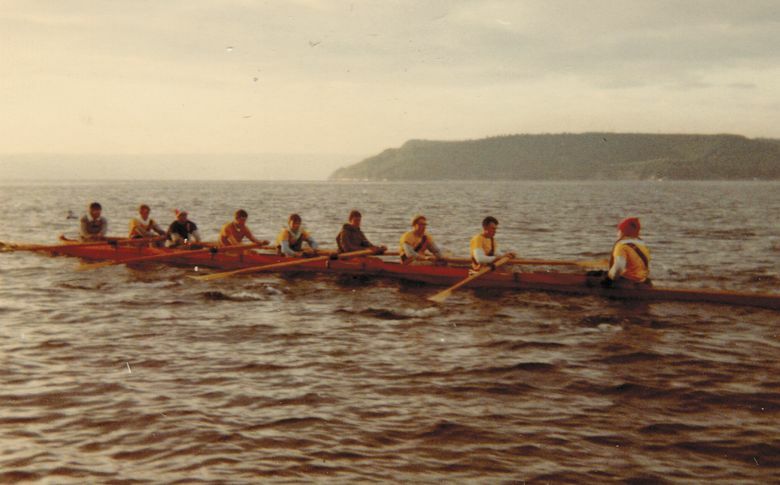 This adventure of risk — and its rewards — will be remembered and celebrated June 20-22 when the Pacific Lutheran crew gathers for a 50th anniversary reunion of the Rowdown. 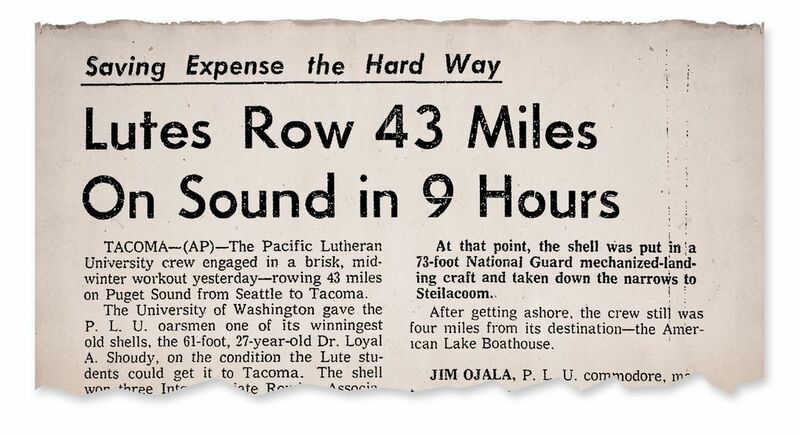 The occasion will feature a return trip over the same route the PLU crew followed Dec. 16, 1967. But instead of rowing, the oarsmen will make the voyage aboard a 75-foot powerboat. Joining the PLU veterans, most of them pushing age 70, for the yacht ride will be Judy Rantz Willman. She is the daughter of Joe Rantz, one of the featured UW rowers in “The Boys in the Boat,” the best-selling book about that celebrated the 1936 UW eight that won an Olympic gold medal in the 1936 Games. The PLU rowers had something in common with that celebrated Washington crew. The Husky Clipper, the shell the Huskies rowed to a gold medal in 1936, had been loaned to the Lutes some three decades later; it was the shell in which PLU oarsmen had learned to row, used in practice and competed in. But UW had decided to bring back the Husky Clipper so it could be put on display, a symbol of the Huskies’ greatest rowing triumph; a truck arrived at the PLU boathouse to haul the shell back to the Seattle campus. The Lutes were promised a replacement shell, the Loyal Shoudy, assuming they could figure out how to get it back to Tacoma. Despite the threat of bad weather and what could be rough waters in a boat hardly designed for those conditions, the Pacific Lutheran oarsmen didn’t seem to be the least bit intimidated. Ojala felt his teammates were “too excited, innocent and naive to have any feelings of trepidation. I never had a doubt. None of us did. We thought we were invincible, that, if we banded together we could accomplish anything we set our minds to. Plus we had the support of our parents. Then a story in the Seattle Post-Intelligencer announced what the crew was planning. But the crew, according to Norm Purvis, who pulled the bow oar, was excited. 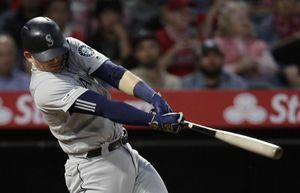 “We desperately needed another 8-man shell,” Purvis said. “We had no coach. Everything was up to us from raising funds, repairing equipment, recruiting oarsmen, scheduling and hosting regattas. We loved rowing but we were always living on the edge. There was a dusting of snow on the ground as the PLU oarsmen carried the Loyal Shoudy the two and a half miles from Green Lake to a public boat launch on the Lake Washington Ship Canal. 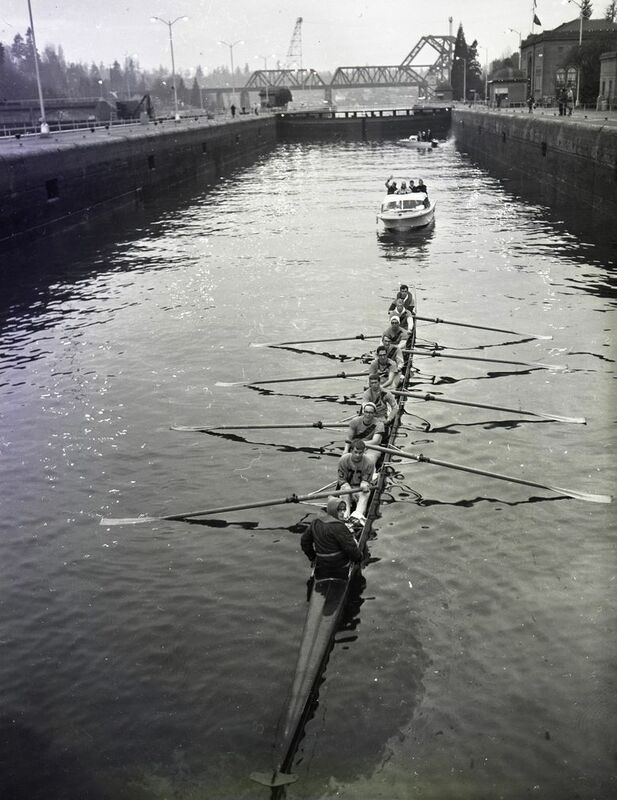 Supported by two small powerboats, carrying a handful of backup rowers plus a Post-Intelligencer sports writer and photographer, the shell coasted through the Hiram Chittenden Locks. Coming around West Point and heading south to Elliott Bay, the water conditions changed. Waves pushed by a strong rip tide slapped across the bow and the shell started taking on water. In danger of swamping, coxswain Jim Bartlett quickly handed emergency buckets to the four oarsmen in the stern of the boat. They started bailing while the other four continued rowing. Looking back, the PLU Rowers agreed this was their supreme test. In the bow seat and taking the worst of the waves and wind, Purvis agreed that their situation was tenuous. “We were all soaked with cold saltwater on a snowy December day; we were barely making progress,” he said. “Waves were breaking over the gunwales and some waves were breaking over the bow and hitting me in the back. Even as idealistic as we were, I doubt if any of us believed we could make it unless the waves let up. This was hard physically, but really hard on our spirits. “We were not prepared for this weather nor the rough seas. Most, if not all of us, only had cotton sweatshirts and sweatpants with layers of other cotton fabrics. Soon we were soaked to the skin. Rowing is an amazing exercise and although we were cold our muscles were producing heat. Ojala was pragmatic about the situation. Wiitala said he was glad he was a rower and not a bailer. “At least when you’re rowing it keeps you warm,” he said. The waves subsided somewhat as the crew neared Alki Point and the decision was made to substitute replacements for four of the fatiguing eight rowers and the coxswain. Roger Hansen, one of the spare rowers who had watched from a support boat as the crew struggled, saw how physical the ordeal had become. Because the coxswain didn’t row he didn’t benefit from the physical activity of the oarsmen. The Seattle Times in 1967 chronicles The Loyal Shoudy making its way into the Ballard Locks. With fresh bodies in the shell, the next destination on their route was Saltwater State Park in Des Moines, where family and friends of the rowers had prepared hot food and a chance to dry out and warm up. There was a huge bonfire. 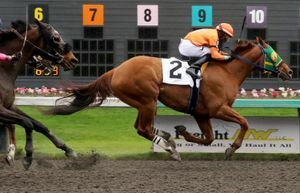 More lineup changes were made for the next leg of the trip, which ended at the Point Defiance boathouse. Revitalized but behind schedule, the crew was soon back on the water, steadily making its way toward Commencement Bay. The seas had calmed and as dusk approached the sun appeared. The biggest concern still facing the PLU team was getting through the treacherous Tacoma Narrows on the way to its ultimate destination, Steilacoom. With twilight approaching and Commencement Bay off its port bow, the shell was approached by what looked to be several World War II-style landing craft, like those used on the beaches of Normandy and in the South Pacific. A voice from the boat, operated by the Washington National Guard, hollered: “Need a lift?” The quick answer: Of course. It turned out that the Guardsmen had read about the quest and were keeping an eye out for the PLU rowers. The seamen aboard the LST agreed to transport the shell the rest of the way to Steilacoom, but getting the rowing craft aboard on open water proved to be a delicate maneuver. So they moved to the Point Defiance boathouse; the LST’s ramp was lowered on the beach and the PLU rowers walked the Loyal Shoudy up the ramp and onto the naval boat. Ojala and several others stayed with the shell on the LST as it made its way through the Narrows under the huge bridge and finally arrived in Steilacoom. The shell was safely stored there for several nights. A local trucking company offered to transport the shell free of cost to the boathouse, saving the men an extra walk and row. Holmes said he got a ride back to campus and crashed. He got up the morning after the row and attended chapel but fell asleep halfway through the service. There was no celebration for the weary Lutes. 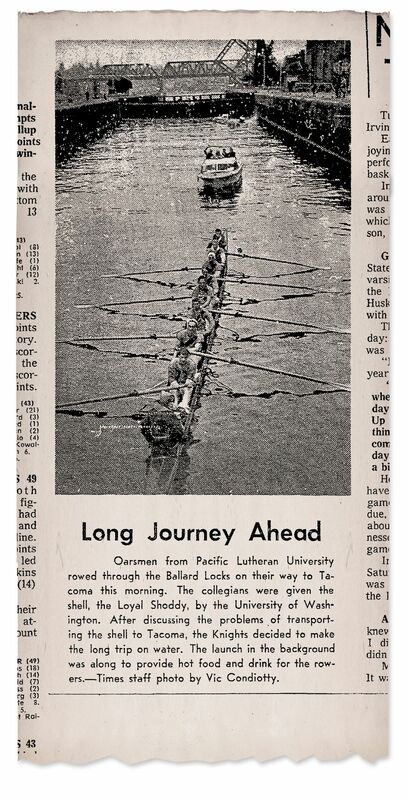 Not many students at PLU realized the school had a rowing program until they read the Post-Intelligencer articles. Ojala said he and a couple other crew members got up early and went looking for the morning edition of the P-I. “That’s when we first saw the amazing article and the equally amazing photographs,” he said. Bill Knight covered the 1967 Rowdown for the Seattle Post-Intelligencer.